A convertible coach equipped with audio and video system takes you on a discovery tour of the city, passing the most famous sites of Lille. Available in 9 languages : french, english, dutch, german, italian, spanish, russian, chinese and japanese. Departure from the Lille Tourist Office (Palais Rihour, Place Rihour). No City-Tour on 1st january, 1st may, 1st weekend of september and 25th december. Free for holders of our City Pass. Disabled people: beware we only have one suitable place on the bus, thank you to contact us in advance to check availability. 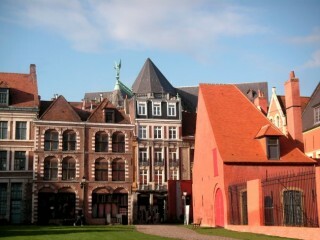 Immerse yourself in Lille's most charming district, where architecture, shops, museums will seduce you ! Stroll around the streets and the squares to discover the heritage, the history and "art of living" of the town through its main sites and monuments: the Palais Rihour, the Main Square, the old stock exchange, the Opera House, the Chamber of Commerce, the Notre-Dame de la Treille cathedral. After a tour that reveals the architectural aspects of the city, the tour ends near the Hospice Comtesse, founded in 1237 by Jeanne de Flandre, which displays works from Lille's past (objects from every day life, wood sculptures, earthenware, furniture and paintings). Free for children under 6 years old and the holders of the City Pass. This tour is a visit to an individual public; if you want to have a private guide thank you to contact our Group Sales (visite@lilletourism.com). Walking tour in english with a guide, every Saturday at 10.15 am. 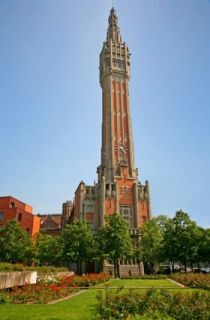 Listed as a World Heritage Site, the town hall Belfry dominates Lille from its height of 104 metres. Once the first 100 steps climbed, take the lift (or walk for the brave!) to the top of the Belfry... and discover in a 360 ° turn Lille and its surroundings, the valley of the Lys and even Mountains Flanders on a clear day! The refurbished gazebo will give you all the keys to understand the development of the city, from its origins to contemporary urban transformations. Closed on January 1st, May 1st, November 25th & December 25th. The Belfry can be subject to exceptional emergency closings due to the weather conditions. On site, you can rent binoculars €1) and audio guides (€2). Free the first Wednesday of each month: only for individuals. No reservation, thank you to present on the spot. - The Belfry is not accessible to people with reduced mobility. 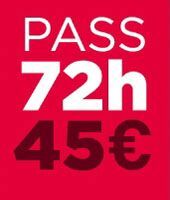 - The ticket is neither a priority-access ticket, nor a priority reservation; the climb will be upon arrival time, according availibilities. - For bookings of more than 10 people, please send us an email. - Online booking is not possible for the same day: you'll be able to buy your tickets directly at the ticket desk of the Belfry. To comply with the Vigipirate national security program, we may need to check your bags. Big bags and suitcases are not allowed inside (maximum size allowed: plane cabin type luggage). Anyone refusing to comply with these security checks and measures will not be allowed inside the building. We thank you for understanding.